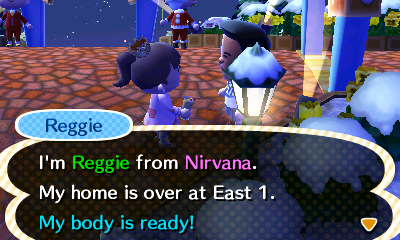 Reggie is there again! Looking no different than last time. 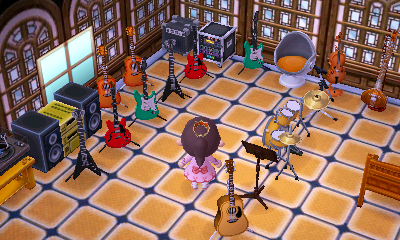 Even his house is the same. I wonder if this means the cycle is starting over now. Kinda sad there won’t be anymore new ones then though. Posted in Animal Crossing: New Leaf, Daily Playthrough | Comments Off on SpotPass Cycle? It’s raining today–which makes me honestly think the game knows how I feel. Between initial stress of not being able to find my game and then the actual confirmation of a Nintendo World Event the evening of the 11th, I’m pretty stressed out–even if it’s something I can’t control for over 10 days. 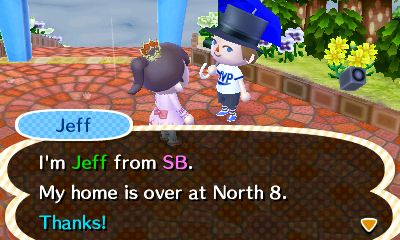 I actually had a lot of trouble finding my villagers today… it seems they were scattered rather randomly :/ Regardless, nobody really wanted anything either which seemed kind of odd. Not really in the mindset to think too much about it though. There was a new SpotPass House at least! I didn’t do much else though. Just too much happening 🙁 At the very least, new DLC tomorrow and hopefully I will be able to visit Resetti again!